Our wrestling season started with a lot of fresh faces attending our Novice Wrestling Clinic which began in October of 2014. Many of the new wrestlers enjoyed the clinic and registered for the regular season. The new wrestlers and parents that joined the regular season team this year only added to the energy in the wrestling room as we kicked off the regular season in November. We competed in two leagues again this year; the Jersey Shore Junior Wrestling League which comprised of teams from both Monmouth and Ocean counties and the Mid-Jersey Wrestling League which comprised of teams from Monmouth and Middlesex Counties. The team practiced hard every Tuesday and Thursday from 6:00 pm to 7:30 pm. 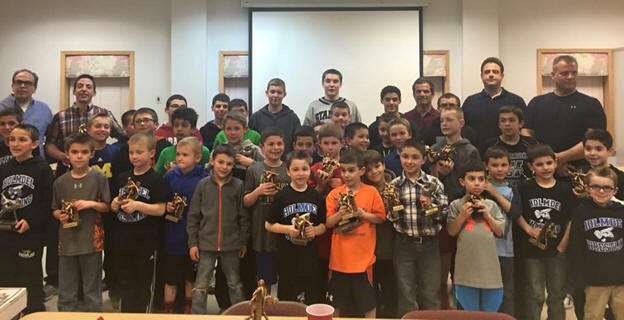 The season concluded in late February with tournaments in both leagues. Our HYAA wrestling team wrestled in JSJWL league’s “B” Division where we won six matches and lost six by six points or less. We did not wrestle a full line-up but all the boys competed to win every team match. We had some very close team matches with Stafford II, Freehold, and Matawan that could have been wins with just one additional middle weight or heavyweight in our lineup. In the year end JSJWL individual tournament, Dean Gallo (114 lbs.) entered the day with a perfect 8-0 record and AJ Fernandez (56 lbs.) came in at 11-1. Both Dean and AJ won first place. Victor Wladika wrestled his way to third place. Brian Frothingham (60 bs) had a great fourth place finish. Matteo Pinnero (80 lbs.) and Tommy Ammirati (107 lbs.) both came in a commanding fifth place and Luke Dupont (90 lbs.) had his arm raised in a strong sixth place finish. Our second year in the MJWL league was a great experience. MJWL is a 6th grade and under league and ran concurrently with the JSJWL season giving our wrestlers plenty of opportunity to compete on different levels. The boys wrestled in both the “A” and “B” divisions of the MJWL. The team entered the end of the year “A” division Tournament ranked as the seventh seeded team out of thirteen teams but after some gutsy bouts and performances finished the day as the third place team overall! We had three finalists in Brian Frothingham, Matteo Pinnero and Luke Dupont. Holmdel crowned two champions in Brian Frothingham (60 lbs.) and Matteo Pinnero (85 lbs.). Luke Dupont (90 lbs.) finished in second place and Michael Catalfumo (HWT) rounded out the medal winners with a fourth place finish. The team also competed in the end of the season “B” Tournament sending 17 wrestlers to compete on that day. Once again, Holmdel wrestled strong and 10 out of the 17 wrestlers who entered the tournament earned medals including four first place finishers, three second place and three third place winners. The tournament champions were Frankie Boardwick (55lbs. ), Alex Reyes (60 lbs. ), AJ Todisco (65lbs.) and Jack Podesta (80 lbs.). Overall, we had a very successful second year in the MJWL and clearly showed signs of improvement culminating in the “A” division third place finish. Lori Ammirati continued her role organizing the snack table for the team during our home matches arriving early to set up and staying late to break down the table. Dana DuPont continued her role as Team Manager, helping organize match data and keeping the parent’s informed regarding practices, matches and tournaments. Each has been with the team for five years in their respective roles. Isabella Pinnero continued her role for a third year as the JSJWL match score keeper. A new Wrestling Promotions team lead by Gloria Vanderham was initiated during the season. 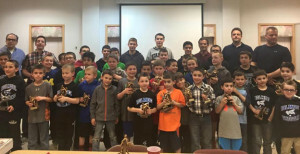 Gloria and her team of dedicated volunteer parents met for an initial kick off midway through the season and quickly initiated a wide array of promotional events aimed at driving increased participation and broadening community awareness of the sport. Promotion projects included a Holmdel wrestling car magnet, an official HYAA wrestling banner, lawn signs to promote registration, participation in HYAA Community Day in Spring 2015, a team photo night, new coordinated warm ups, a video of the team produced by the High School film club and a very successful Parent’s Night Out. All of these projects were new to the HYAA wrestling program and the coach’s look forward to reaping the benefits of the Promotion Team’s hard work throughout the upcoming year. HYAA will conduct a Spring Wrestling Clinic beginning April 1st and ending on June 5th, 2015. Practice will be from 6:00 pm to 7:30 pm Wednesday and Friday with all boys K thru 12th grade welcomed. The clinic is designed to stress basic wrestling technique as well as strength and conditioning training so we can continue the progress our team has made. Third Row: Coach Andrew Pinnero, Coach Orlando Reyes, Tom Ilvento, Thomas Ammirati, Antonio Ricciardi, Sergio Ricciardi, Chris Bell, Vick Wladika, Luke Dupont, Dean Gallo, Coach Jim Ilvento, Coach Mike Catalfumo, Coach George Lazarou, Coach Scott Dupont. Not Pictured: Kyle Kapcsos, Qusay Elsakr, Maxim Gulko.